On a brilliant sunny afternoon the two form sides in the league went head-to-head at Winch’s Field and neither side disappointed, producing end-to-end stuff for pretty much the whole match. Playing in front of a good sized crowd of 309, with a good away following, the game got underway with the home side kicking up the slope and it was Herne Bay who started the quicker, albeit not causing too many problems for the Hornets’ defence. It was the visitors who had the first opening when Lee Harding put Chris Smith through on goal, returning the ball to Harding whose shot was blocked. The rebound fell to Rob O’Toole and his effort was deflected out for the first of two successive corners, the second of which saw Harding’s cross met by skipper Jack Brivio who put his header just wide. Apart from the odd push into Horsham’s half, the visitors were applying pressure and a foul on Harding enabled the winger to pick out the head of O’Toole but the home defence were able to clear for a corner. Harding’s deep delivery found Joe Shelley beyond the back post and when his header came back off the bar, it fell at the feet of Smith who instantly smashed it past Simon Overland in the home goal. This happened in the seventh minute and sparked the home side into action. Shelley was the hero at the other end when he intercepted a great through ball from the feet of Tahjae Anderson, who was homing in on Josh Pelling’s goal, and with the end-to-end play starting to stretch both defences, Brivio was influential when he put Tyrell Richardson-Brown away down the right flank, his cross winning a corner for the visitors. Herne Bay were building a number of attacks down their right flank; Alexander Mulrooney-Skinner was displaying his attacking skills, twice beating Harvey Sparks he managed to put a perfect cross to the far post where an unmarked Bradley Schafer was lurking and he gratefully accepted the gift, powering his shot past Pelling to bring the scores level in the eighteenth minute. 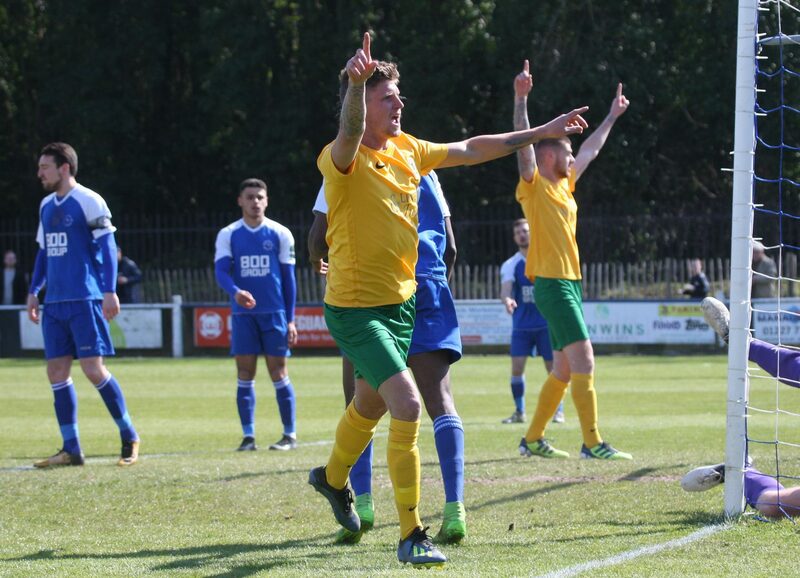 Horsham could have gone behind in the twenty-seventh minute when Danny Leonard’s inch perfect pass put the dangerous Schafer in again, the striker this time failing to hit the target with only Pelling to beat. The home side continued to apply the pressure, having a good spell around the half hour mark, and Leonard was the next to get a low shot on target, Pelling get right behind it to save. Minutes later a free-kick for Herne Bay found Schafer totally unmarked inside the penalty area but Pelling blocking the forward’s shot as he came out to meet the striker, with Schafer going down in the area the home fans behind the goal were shouting for a penalty. Thirty seven minutes gone and Mulrooney -Skinner was free down the right but this time his cross went harmlessly out for a goal kick. A minute later and it was the Hornets on the attack as Richardson-Brown showed his marker a clean pair of heels, his wicked cross into the danger area finding Harding at the far post to plant his header perfectly inside the post to put the Hornets back in front. One last chance before the break fell to Schafer, Daniel Birch’s cross finding the striker’s head but it ended up going just past the post. The news at the break that the other play-off hopefuls were all losing meant the Hornets needed to hang on to their lead to maintain second place. However, the home side were not going to make it easy and, no doubt feeling hard done by at being a goal behind at the break, they immediately began pushing the visitors back and a massive scramble in the Hornets’ penalty area resulted in a corner. At the other end Harding was shown a yellow card for a clumsy shoulder charge on Mulrooney-Skinner and, from the resulting free-kick, hesitancy in the box saw the ball land in front of Anderson who buried his shot with accuracy and power to make it 2-2 and all to play for with thirty-eight minutes still to play. The visitors needed to strike back and Shelley had two headers that went over the bar from Harding’s free-kicks while Birch cleared a dangerous cross into the box from O’Toole with Smith lurking. The game was still going from end-to-end but without any clearcut chances, Brivio coming nearest with a header from a Smith cross. Shelley and Schafer required treatment after a clash of heads, this enabled Kieran Lavery to come on for the tiring Richardson Brown. O’Toole had a half chance but Simon Overland was well-positioned to save and Smith came very close moments later when, receiving the ball twelve yards out and back to goal, he brilliantly turned the defender and slipped the ball to O’Toole who watched his strike beat the keeper and rebound into play from the inside of the post. Smith stretched his neck muscles but his header missing the target. Lavery was to make his mark with sixteen minutes left. Harding, who was now occupying the right wing, cut inside the full-back and picked out the substitute and his shot was hit with power giving Overland no chance, putting the visitors back in front for a third time. With a couple more replacements coming as the minutes ticked down, the referee’s whistle came as a bit of a relief for the Horsham bench and supporters. 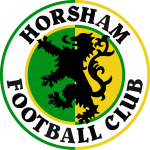 This was an excellent win, confirming their place in the play-offs, and with other results going their way it was a very noisy and happy team coach that returned to Horsham.